Wouldn’t it be cool if you could just snap your fingers and have all the mess in your house put magically in it’s place? You’d be a cleaning ninja. Everyone would want to be your friend. Including me. Because I FOR SURE don’t love cleaning. But I do love a good party. And new dresses. Those aren’t too shabby either. So why not use party throwing and pretty dresses as your motivation to get everything done? Sounds like the perfect cleaning motivation to me. Sold! So I decided to throw myself a housewarming cocktail party. Cocktail attire. Fun summer drinks and appetizers and wonderful people. The room BEFORE the party. The room the DAY OF the party. And of course Kate crashed the photo. And all this effort took was a few new pieces of furniture, a few loads of stuff into the creepy furniture cellar… and a little extra special navigation to coax everything where it needed to go. Thanks Water Boy for your help. 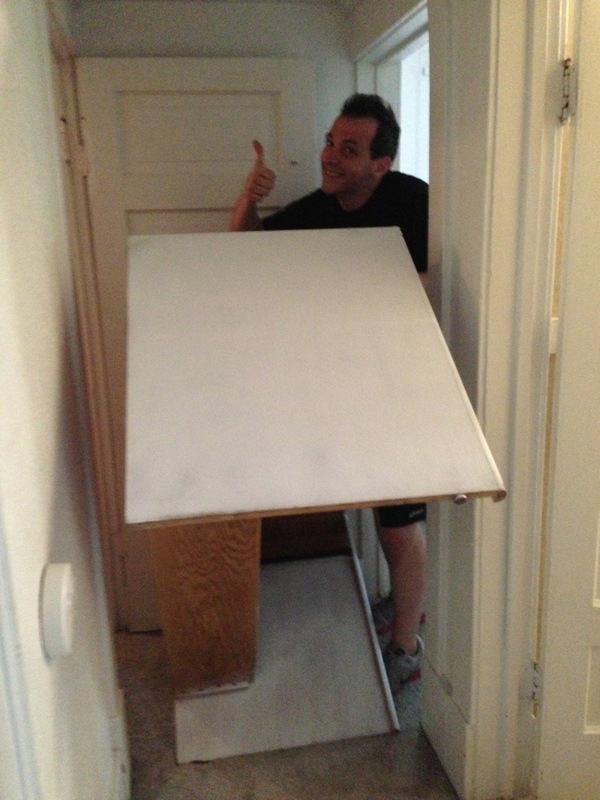 As it turns out, it’s really just not possible to move a desk on your own. Or an armoire. And then, the house was clean, and the friends came over, and there was merriment and smiles all around. And even better, the next morning, I woke up to a clean orderly house. And my internet got installed by a fantastically humorous cable guy. 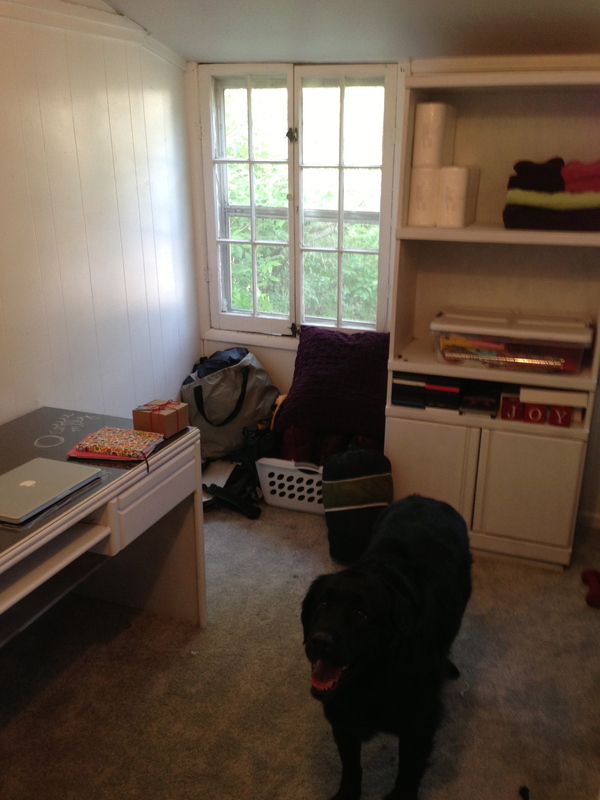 So now the house is well put together and I can blog about it from the comfort of my own bed. I would call that a win. Absolutely. Any other great cleaning motivations? I’m willing to find another cleaning muse! It’s a subtle change, I’m not really sure when it happened. But I’m oh-so-grateful it did. 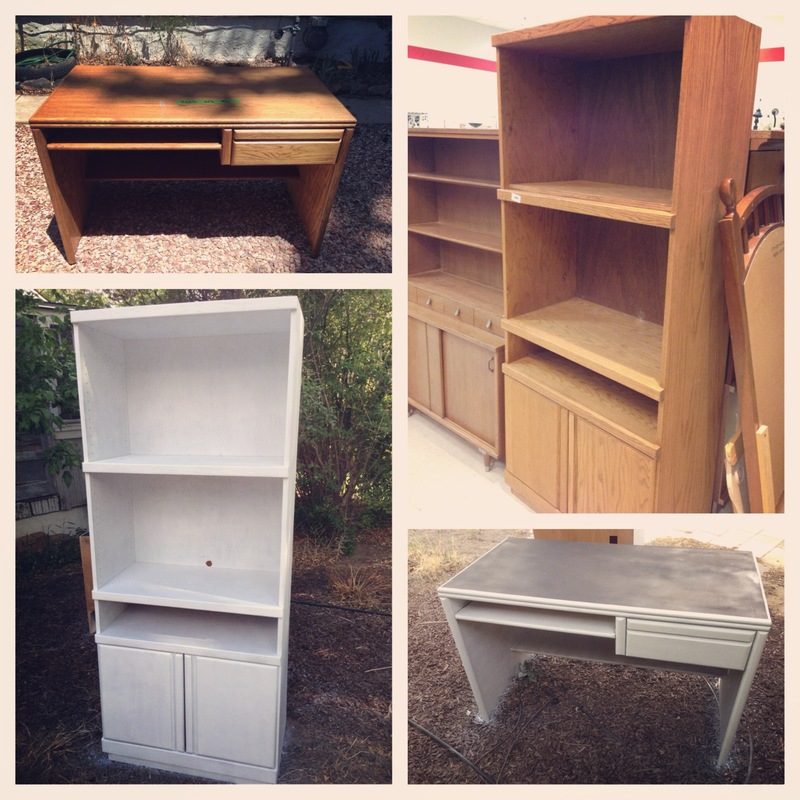 Because when you realize your new place has no linen closet… and you’ve finally got room for a desk – it’s time to thrift shop. And it would only set me back a cool $499 and tax. Cough, sputter, choke. Yeah, that’s no longer happening. So thrift shopping I went and I ended up with both a fully functional (and FUN!) desk, an armoire type piece and a vision. All that was included in the vision was some spray paint and a piece of glass. So after enlisting the help of my friends with a truck (although I had high hopes, the armorie was just too big to fit in my small SUV) who could also help me get the pieces in my back yard, I was ready to sand and spray! One note: when I sprayed all of the furniture in my bedroom, I had used Rust-oleum Primer/Paint and it was amazing. This time I tried another brand first and was more than disappointed. So if you’re painting anything – I’d absolutely advise the Rust-oleum brand of spray paint. It mentions on the bottle it has two times the coverage (which is completely true), it’s only $.10 more than the other brand AND the push nozzle is so-much-better. Which sounds ridiculous, but if you’re about to go through 6 bottles… your finger gets tired and you run the risk of putting your fat finger in front of the spray stream. Trust me. One can of primer for the first layer. Then as much as it takes for full coverage on the rest of it. It’s amazing what a can… or 8… of spray paint will do. Shiny white pracitcally new furniture. 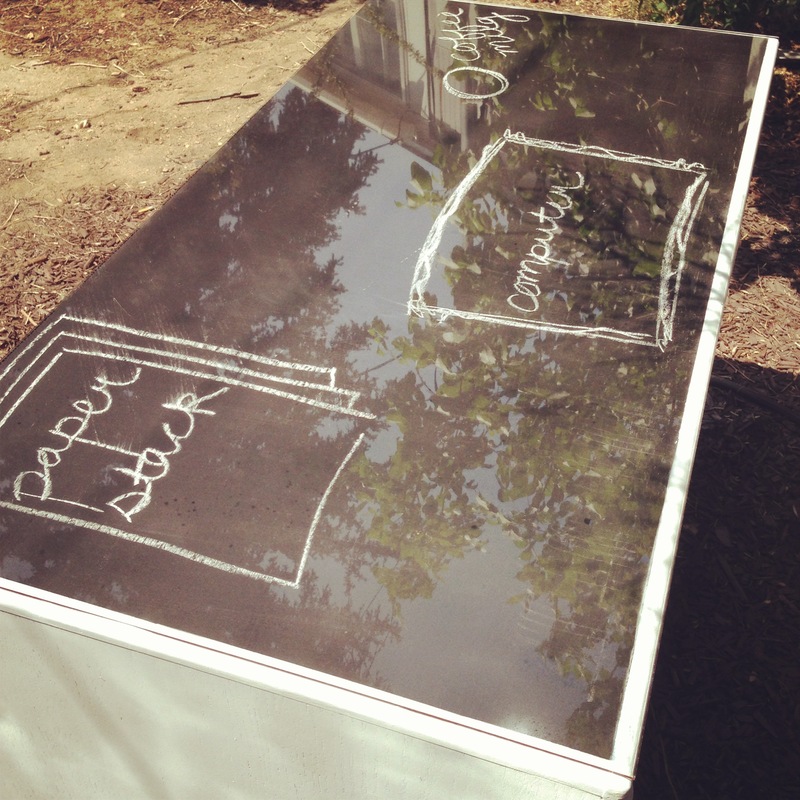 Oh – and the top of the desk, I experimented with chalkboard paint. Thanks to the lovely Water Boy for the suggestion. I’m in love with how it turned out. And since I know you’re thinking “I’m sure with all of those extra supplies – you probably could have bought that amazing and incredible Pottery Barn desk” I’ll let you in on a little secret – I did all of this for practically a quarter of the cost of that fancy little desk. Total spent: $134. Now, I appreciate that I didn’t need the glass. Or the chalkboard paint. Or really probably even the white paint… but that adds a lot of fun and character and it looks great with my already white book case that’ll also be sitting in that room! Once I get everything moved back in the house tonight, I’ll be able to organize the back room a little bit – and I Can. Not. Wait. for things to have a “place” that they belong to. The goal is to have everything in a place it belongs in by Friday. Go ahead and say a prayer for me! It’s expensive and it requires a ridiculous amount of work. I am OUT of the apartment. And into the most wonderful little home! A home! So my evenings of late have been spent unloading boxes of junk (also, when did I accumulate so much stuff? ), getting curtains and organizing. This girl can now use a sewing machine – without breaking anything. Or losing any fingers. 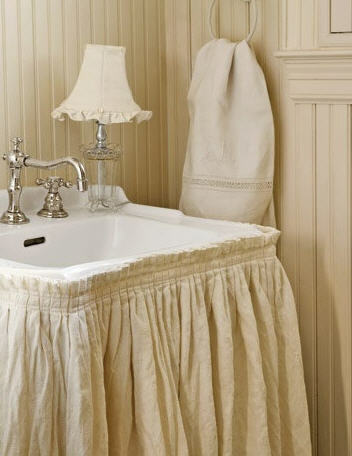 Doesn’t this look like the cutest little cottage bathroom sink?! And in my brain I was like – “no really, I can make that… I just need a sewing machine and some Velcro.” So I emailed my amazing friend Emily (because she’s crafty and awesome) and asked if: 1) she had a sewing machine and 2) if I could borrow it after she gives me a mini lesson on how to use the sucker. Also, she’s insanely smart and brought pins. So, I cut a white sheet that I already had (and don’t use because it was like $5 from Walmart and itchy) in half (length wise) and folded pleats into it and secured those with pins. 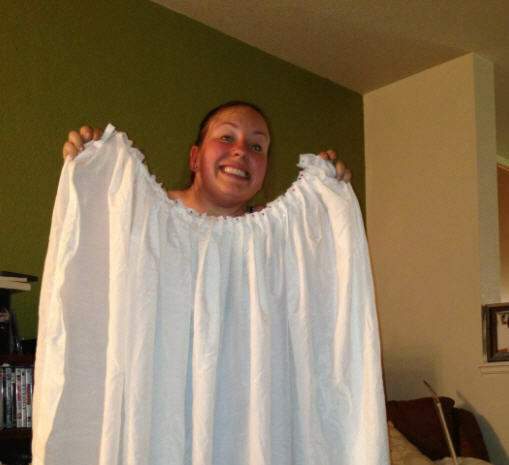 Oh… you can’t see the pleats because of the cheese oozing out? Sorry. I was so excited. And then I just sewed it. It really was that easy. Then I cut one inch pieces of adhesive Velcro – put one side on the sink… one side on the fabric (it just stayed – I thought I was going to have to sew it on!) … and BAM! ugliest sink of all times covered right up! Yes. 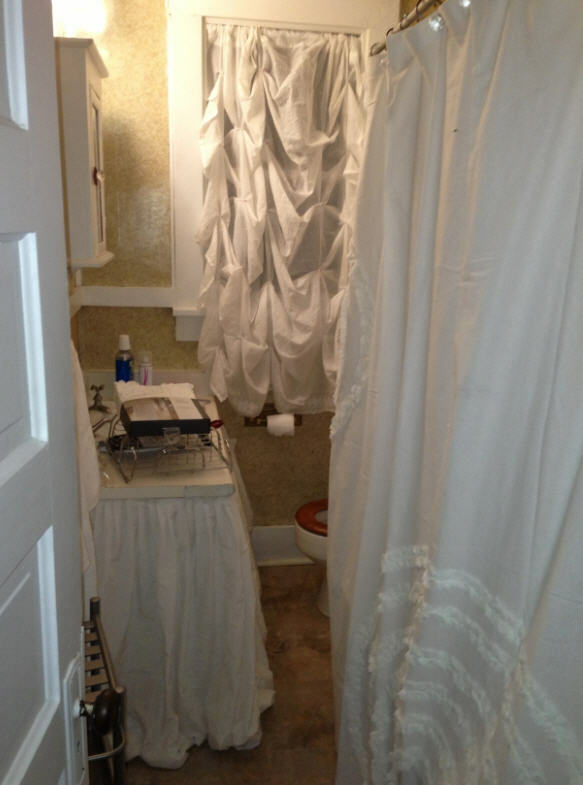 I do have the girliest bathroom of all times. 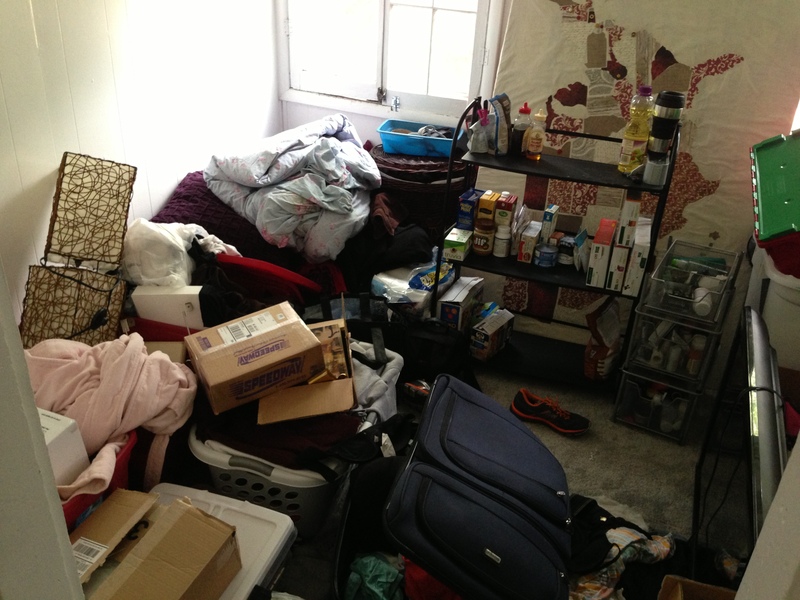 I think it hides the poop brown overtones… Also – ignore the “stuff” everywhere. Did I mention I just moved?! 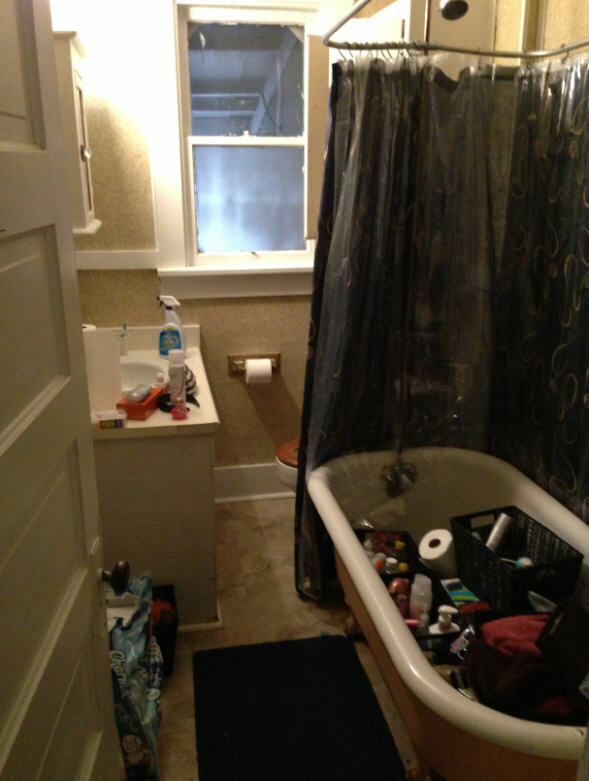 Don’t judge all of the tubs, I came from a bathroom with LOTS of storage to a bathroom with NO storage. Don’t worry, it’s all organized now! So maybe saying “I know how to sew” is a bit strong. But if someone else does all of the setup work, I can absolutely just push the fabric through the machine. So, you know, whatever you’d call that. And then when it’s “all together” I promise to put up photos for a mini house tour!